The S1100i can scan from business card size to A4 and with the use of optional carrier sheets can even scan A3. A4 portrait documents can be scanned at speeds of less than 8 seconds per page. In addition to standard paper types the S1100i can scan plastic cards such as credit cards or membership identity cards. Multiple page documents can be effortlessly scanned thanks to the continuous document feeding function which allows you to insert pages one after another without any extra button pressing by detecting automatically when a sheet enters and exits the scanner. It is also possible to scan doubled-sided documents using this method. To make scanning as simple as possible, ScanSnap inspects each document to decide if a document should be scanned in black and white or colour, what the size of the page being scanned is and eliminate blank pages, all of which serve to speed the scanning operation and minimise your storage requirements. In addition each document will have misaligned text corrected (Auto Deskew) and each page will have its orientation automatically adjusted. 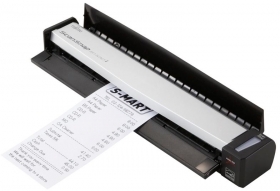 The scanner offers two selectable paper paths, a straight path which is suitable for photos, postcards, business cards, plastic cards and the optional ScanSnap carrier sheet, and a U-turn path which is suitable for most common office paper. The S1100i comes with a linking function to popular cloud services including Dropbox, Google Docs, Evernote, SugarSync and Salesforce CRM. It is now easy to seamlessly link and save your scanned image data virtually anywhere and anytime. Scan to iPad, iPhone, Android or Kindle devices via the downloadable ScanSnap Connect application. Upload your document fast, securely and easily; instantly display and share. If no scanning interface is available Windows users can select the 'ScanSnap folder' option within the cloud application which then allows you to scan directly to the cloud through the import capability. QuickMenu is an easy to use and navigate way to speedily direct scanned data to applications of your choice presenting a series of icons to choose from and direct the document whether it be to a Microsoft Office application, physical folder or machine, or to the cloud. To minimise pre and post processing time the S1100i comes equipped with a host of intelligent automated features including automatic deskew and automatic rotation ensuring the scanned image is displayed upright and without slant. Automatic colour detection and page size detection also ensures the scanned image needs no manipulation and storage size is kept to a minimum, These functions make pre-scan work like sorting pages and changing scan settings unnecessary, so you can scan your documents with minimal effort. Additionally the S1100i comes with business card software allowing the user to scan business cards and import the data into packages such as Excel, Outlook, Address Book and other database programs for fast referencing and application. Through the bundled ABBYY FineReader for ScanSnap you scan directly into Microsoft Word, Excel and PowerPoint (Mac: only Excel and Word) enabling the creation of editable data.